Located two hours south of Hanoi en route, via train or bus, to Vietnam’s central region, Ninh Binh province is conveniently located for an excursion from Hanoi or as a stop-off on your way up or down Vietnam. How should you make the most of a couple of days there? We’ve put together some tips to get the ball rolling on planning your ... Read more about A few days in Ninh Binh . A large swathe of land in Ninh Binh province is characterised by stony outcrops not unlike those at Ha Long Bay, though a bit smaller in size and of course without the water—lakes and rivers aside. 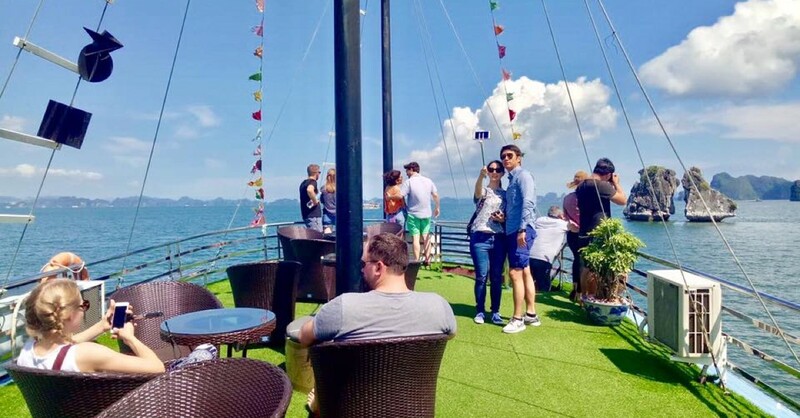 If you’re there at the right time of the year, when the paddies are full of water, the reflections make the landscape almost as beautiful as Ha Long Bay. The best ways to enjoy the scenery ... Read more about Boat trips at Tam Coc and Trang An . Hoa Lu is the ancient capital of the Dinh and Le dynasties which dates back to the 11th century. Serene and tranquil, it is set in beautiful surroundings beside to Truong Yen village and is easily visited on a day trip from Ninh Binh. However, as beautiful as the surroundings may be, the remains themselves are really non-existent, with the only buildings of interest being some temples which ... Read more about Hoa Lu . At Bich Dong there’s a series of pagodas and a fascinating collection of caves farther up the outcrop. Some of these caves were used by the Viet Minh to hide from the French during the First Indochina War. The caves are full of stalactites that have been carved into Buddhist images, as well as stalactites that are hollow upon which tunes can be played. You can climb all the way to the top of ... Read more about Bich Dong . We’d done our research on the new Bai Dinh Pagoda before heading there to check it out, and ‘new’ and ‘big’ seemed the most dominant adjectives being used, so we weren’t expecting much. However, we were pleasantly surprised: yes, it is new, and therefore lacking historical interest, and there is no denying it’s big -- the biggest pagoda complex in Vietnam -- but a visit is one of those ... Read more about Bai Dinh Pagoda . Located about 29km south east of Ninh Binh in Kim Son district and only a few km away from the Gulf of Tonkin, Phat Diem is of historical importance and a real hit with Vietnamese tourists. It is in this area that the French and Portuguese missionaries first introduced Catholicism to Vietnam. While most Christians fled south, settling between Dalat and Saigon after the communists seized power ... Read more about Phat Diem Cathedral . Located 120 kilometres south of Hanoi, Cuc Phuong national park was established in 1962 and is the oldest national park in ... Read more about Cuc Phuong National Park .